Aaron’s friends describe him by noting that no matter how the deck was stacked against him, he always found a silver lining. Aaron was a very proud Native American from the Chippewa tribe. Born May 17, 1962 in Duluth, Minnesota, and raised in foster care, he didn’t share much from his childhood, only that he didn’t want his children to have the same experience. Aaron met his first love, the mother of his son Charlie, at a Grateful Dead concert. She passed away when Charlie was quite young, leaving Aaron to raise him on his own. Charlie lived with grandparents in New York for a few years as a preschooler and in his early teens. When he was 15 Charlie chose to live with his father who loved him so very much. Aaron came to Humboldt County about 23 years ago. Here he entered a clean and sober program where he succeeded and used what he learned to avoid any substance use dis-order. He was a whiz with math and attended College of the Redwoods and then Humboldt State University where he nearly achieved his degree in environmental science. He worked several years as a carpenter building custom homes in Shelter Cove. In addition to his joking, laughter, good heart and doing all he could to help others, Aaron was known for his love of the Grateful Dead. But with the birth of his daughter Komorebi, Aaron had a NEW love in his life. 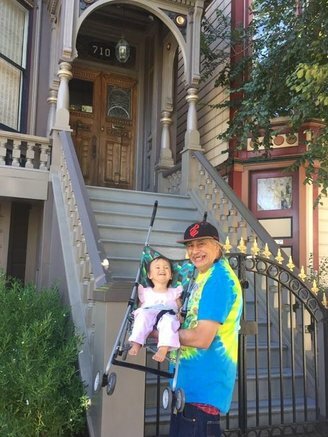 Perhaps one of his particularly happy moments was taking her to the former home of the Grateful Dead. 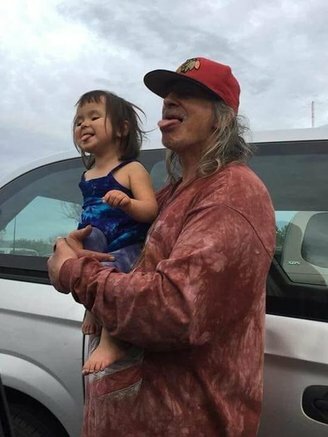 In addition to his son Charlie Paul Kangas, and his daughter Komorebi Mae Kangas, Aaron is survived by two month old granddaughter, Cadence Rose Kangas, his dog Tierney, and many friends who loved and will miss him. Aaron Wade Kangas was likely on his way to see his daughter the morning of January 22, 2019 when he was struck and killed in a tragic accident. Despite rumors to the contrary, he was happy. A candlelight vigil is being organized for family and friends. Wield to the storm and fly. The obituary above was submitted on behalf of Aaron Kangas’ family and friends. The Lost Coast Outpost runs obituaries of Humboldt County residents at no charge. See guidelines here.